Let’s be honest, when you live in a country like the UK, for most of the year, hot drinks are a survival aid. For years, the standard way of getting hot water was to boil a kettle, first over a fire, then on a hob, then via electricity, but now instant hot water dispensers are taking over from standard kettles as being both convenient and environmentally friendly. An instant hot water dispenser consists of a main water tank and a smaller reservoir. When you want hot water, the instant hot water dispenser transfers the appropriate amount of water from the main tank into the reservoir and heats it there, before dispensing it into your cup or mug (or other container) without the need for you to pour. Instant hot water dispensers are not, therefore, quite instant, but they are very fast indeed, often much faster than a standard kettle. Some people appreciate instant hot water dispensers for their convenience, in particular their speed. After all, if you’re desperate for a hot drink to warm you up or help you settle down after a long day, you probably want it as quickly as possible. Instant hot water dispensers can also be useful for other standard household tasks such as filling hot-water bottles or getting hot water for cleaning. Other people appreciate instant hot water dispensers for their economy and corresponding environmental benefits. When you use an instant hot water dispenser it’s much easier to heat only what you need and thus reduce the amount of electricity you use. Increasingly, however, instant hot water dispensers are bought for reasons of safety. They’re great for both the elderly and older children, basically people who appreciate hot drinks but who may not have the strength to manage to pour a kettle safely. They can also be a benefit in houses with younger children, since it’s much more difficult to have an accident when using them. It’s also worth noting that although our instant hot water dispenser review was created for people looking for instant hot water dispensers for their home, we think that the options we list would also be appropriate for small businesses and could have health-and-safety benefits as compared to standard kettles. Overall, we have noticed that instant hot water dispensers have been improving significantly over recent years and we strongly believe that their convenience, economy and safety will see them replace standard kettles in the near future. Here is our pick of the best instant hot water dispensers currently available on the UK market based on capacity, functionality, reliability and general value for money. The Addis Thermo Pot comes in 3.5L and 5L versions, which makes it by far the biggest instant hot water dispenser in our list. It also has a very different appearance than the other instant hot water dispensers on our list, in fact it looks like a rather high-tech urn, which is fair enough because that’s essentially what it is. As with urns in general, the water tank is integrated into the body, which means that you would have to move the whole unit to a sink to fill it. While this is theoretically possible, the smaller of the two sizes holds 3.5 litres of water and the larger holds 5 litres and that would be a lot of weight to carry so filling the tank with a jug or bottle would probably be a better idea. In addition to being the biggest option on our list, the Addis Thermo Pot also offers the most functionality. 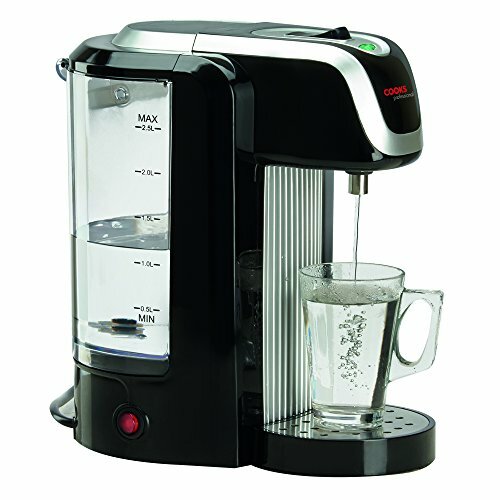 We really like the fact that it can dispense up to 600ml of water in one go, as that is not only enough to fill up mugs (as opposed to cups) but is also more convenient for cooking, e.g. making gravy. We also like the fact that this is the only instant hot water dispenser we’ve found which offers variable temperature, making it potentially even more economical to run. The Breville VKJ318 is stylish as well as practical. We really liked the black and silver exterior and it looks particularly good when in use as the clear glass of the 2L water tank turns blue thanks to an interior LED. While good looks are nice, it’s the performance which really matters and the Breville VKJ318 has a lot to offer. The main body of the unit lifts up off the base so you can easily fill it up just like a kettle. The Breville VKJ318 is also designed to hold a filter, which is good news for the many people who have hard water. With your jug full (or at least full enough), you choose your cup size (from a selection of 9) and press a button. The 3 kW concealed element does a great job of heating water quickly (plus it makes the hot-water dispenser easier to clean). You can have a single cup ready in as little as 40 seconds and if your cup is “between sizes” you can choose the next size up and use the manual-stop button when it’s full. Any drips go straight into the convenient drip tray, which is dishwasher-safe. We think that the shaping of the Breville VKJ142 gives it a bit of a “space age” look, which we rather like. It does have to be said that its functionality is very definitely not space age, the Breville VKJ142 is Breville’s first-generation instant hot water dispenser and it shows, but on the other hand, the reason it’s still for sale is because there are a lot of people who want an instant hot-water dispenser which “just does the job” and comes at an affordable price. What the Breville VKJ142 does it does very well, hence its place on our list. The water tank holds 1.5L of water plus a limescale filter. It comes away from the body for filling and has a nice, wide opening to fit under any tap. The Breville VKJ142 dispenses 250ml at a time, so one helping will fill the average cup and two helpings will fill the average mug. Any drips go straight into the dishwasher-proof drip tray. You’re not going to be waiting long for your water as the 3 kW concealed element makes for fast heading (and easy cleaning). 1.5 litre illuminating water tank with extra-large rear water window. capacity: 230-240 Volts. The Breville VKT124 has the sort of appearance you’re either going to love or hate. Stylistically it could look rather out of place in a traditional or rustic kitchen, but could be absolutely great in a minimalist or industrial one. Its headline feature is the fact that the drip tray moves up and down on a magnet so as to make it easier to fill cups and mugs of different sizes without creating drips. In fact the drip tray can be removed completely for the very largest mugs (or to clean it, it’s dishwasher-safe). 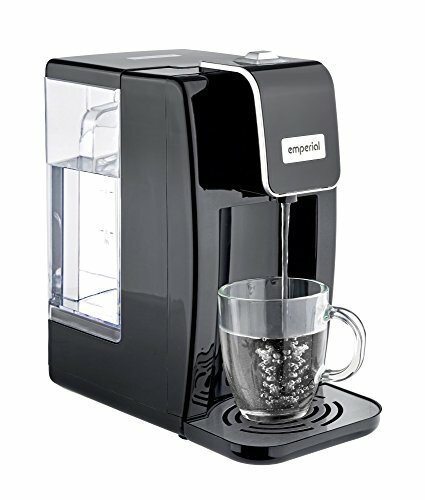 Notwithstanding this, and perhaps rather surprisingly given its headline selling point, the Breville VKT124 only dispenses water in 250 ml servings, which means that if you want to fill up a large mug you will need more than one serving. If you have an “in between” mug, then there is also a manual stop button. On the plus side, however, you’re not going to be waiting long for your hot water as the Breville VKT124 has a 3 kW flat element for fast boil times and easy cleaning. Although, in principle, the 1.7L water tank on the Breville VKT124 can be filled like a kettle, the combination of its shape and the fact that the tank opening is on the narrower side, means that we’d suggest filling it with a jug or even a bottle. We’d also suggest making a point of treating the lid gently as it’s the one part of the Breville VKT124 which we think could do with being a bit sturdier. On the plus side, the Breville VKT124 comes with a permanent anti-limescale filter, which is good news for those in hard-water areas. In terms of appearance, the Breville VKJ367-01 definitely has a lot going for it, in fact it’s one of the swishest kitchen appliances we’ve seen not just one of the swishest instant hot water dispensers. 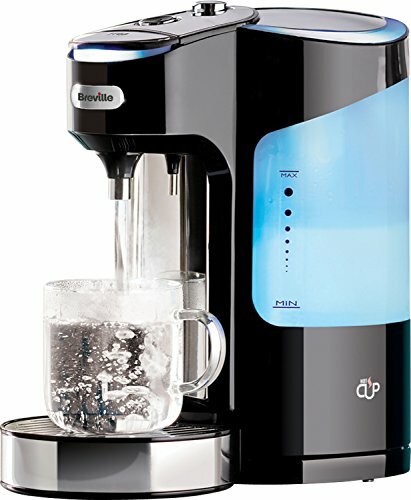 It’s also one of Breville’s third-generation instant hot water dispensers so it has a lot of functionality. The water tank holds 1.8 litres and has a generous opening for easy filling. The body can be detached from the base, so, in principle, you can fill the Breville VKJ367-01 in the same way as a kettle but 1.8L of water does weigh quite a bit so in practice you might want to use a jug or bottle. As its full name suggests, the Breville VKJ367-01 has variable dispense, which basically means that there are nine serving sizes to choose from with a manual stop button for those “between size” cups and mugs. 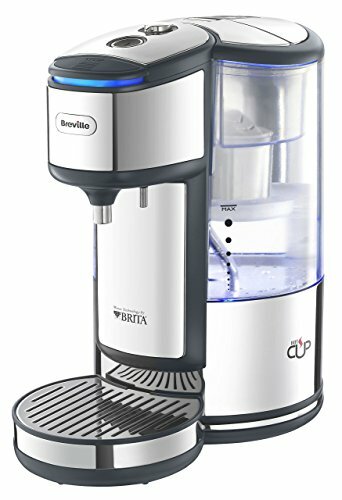 Like most Breville instant hot water dispensers, the Breville VKJ367-01 has a 3 kW flat element, so it does a super-speedy job of heating up water (and it’s easy to clean) plus a limescale filter to ensure that you can still enjoy delicate-flavoured drinks even in hard-water areas. In terms of appearance, the Cooks Professional Electric Instant Hot Water Dispenser strikes us as having a bit of a 1960s vibe but even if you’re not into the vintage look we think most people will still be happy enough to have it on their counter. For us, the key selling point of the Cooks Professional Electric Instant Hot Water Dispenser is the generously-sized 2.5L water tank or, more accurately, water bucket. We mean that literally, you flip up the lid to uncover the entirety of the top and then you see that there’s a miniature bucket handle lying flush with the main body of the container. This makes it super easy to refill the Cooks Professional Electric Instant Hot Water Dispenser and we particularly like the fact that the maximum level is still comfortably below the top of the bucket. 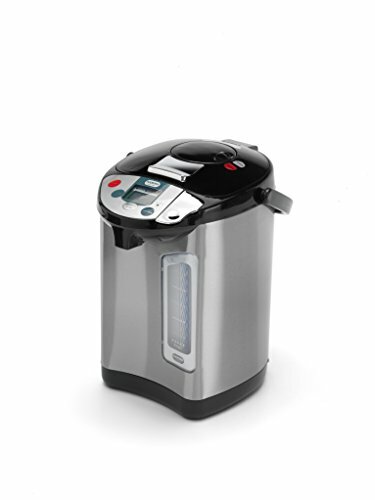 The Cooks Professional Electric Instant Hot Water Dispenser heats the water as it goes through the machine, which means there is no preset dispense amount. You just press a button to start and stop the flow. While the 2.6 kW isn’t the most powerful element there is, it still heats up water very quickly and certainly compares favourably to a kettle. Our one slight gripe about the Cooks Professional Electric Instant Hot Water Dispenser is that it doesn’t have cord storage, however you can get around this by just buying a separate cord tidy. It has to be said that the Emperial Instant Hot Water Dispenser Kettle has a very distinct, industrial-minimalist appearance, which may be out of place in certain kitchens, although the flip side of this fact is, of course, that it will look perfect in others. On the practical side, there is a 2.2L water tank, which detaches from the main body for filling or cleaning. Alternatively, you can fill it using a jug or bottle as the wide opening makes it easy to get the water where it should be without splashing. Speaking of splashing, the drip tray can also be removed for quick emptying and cleaning. Although the 2.6 kW heating element isn’t the most powerful out there, it is still enough to deliver up to 500ml of hot water in under a minute, which is plenty for a quick mug of tea. One quirk of this instant hot water dispenser is the fact that it starts to pour as soon as it boils but only stops when you press the manual stop button. While some people may find this limiting, our view is that the water is ready so quickly it’s irrelevant. 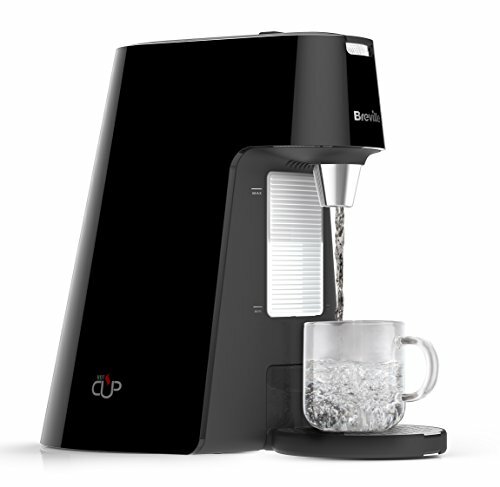 BOIL WATER INSTANTLY: Reaches temperatures of up to 100C in a matter of seconds, produces boiling water at the simple press of a button. The VonShef Hot Water Dispenser Instant Kettle is currently offered in two colours, which could be handy if you’re struggling to find a larger instant hot water dispenser, which also fits with your kitchen style. It has a capacious 2.5L water tank, which can be removed for cleaning or filling, although we would suggest that you’d probably find it easier to fill it with a jug or bottle. The opening is wide enough for this to be done easily. You will, however, have to remove the water tank at least once as there is a drain plug there (basically a screw which is currently grey) and you need to tighten this before first use to create a good seal and hence avoid water leakage. We didn’t see this mentioned in the manual (although we admit we could have missed it, even after double-checking), so please take note. 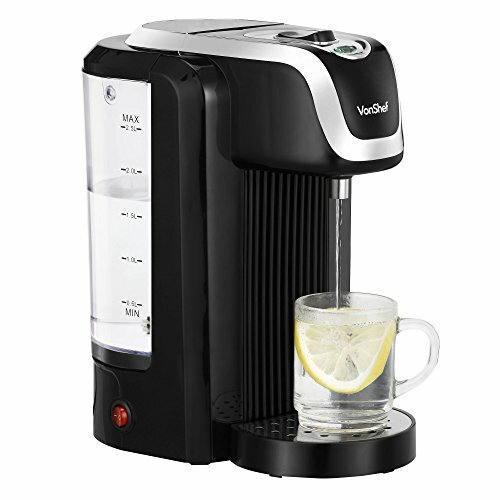 Another important point is that the VonShef Hot Water Dispenser Instant Kettle starts to dispense as soon as it boils and only stops when you press the stop button. It boils very quickly so you need to have a cup ready under it and be nearby to stop the dispense before it overflows. Having said that, even though the 2.6 kW element isn’t the very fastest there is, it still heats up to 500 ml of water in under a minute so in practical terms we doubt very much that this is going to be an issue. BOILING WATER INSTANTLY - Powerful 2600W heating element boils water to at least 95°C in just a few seconds. SAVES WATER - Boil just as much as you need for a time and energy efficient alternative to your standard kettle. Includes 1L filling jug! REMOVABLE DRIP TRAY - Slide off drip tray prevents unwanted spills whilst offering convenient and safe emptying. As always, there is no one “best instant hot water kettle” for everyone, the best instant hot water kettle for you is the one which best suits your situation. People who live in hard-water areas might want to head to the Breville instant hot water kettles as their first choices, since the Breville options on our list all come with integrated filters. 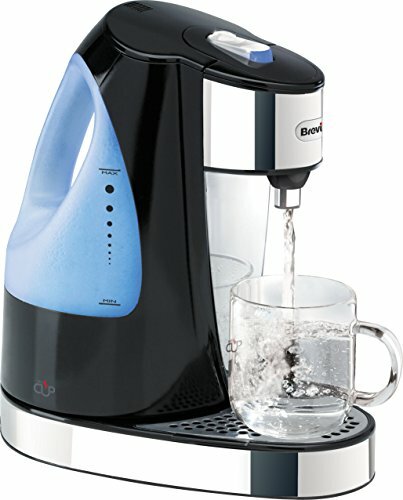 The Breville instant hot water kettles are still a good option for people in soft-water areas, or who do their filtering in other ways and likewise the other instant hot water kettles on our list can be used in harder-water areas although it’s generally advisable to filter the water first to reduce limescale. We suspect that for many people the choice of instant hot water kettle will essentially come down to capacity and price as well as availability at time of purchase.